description = "Customization on core Ubercart tax line item remove functionality from admin"
* Custom Ubercart Tax remove module. 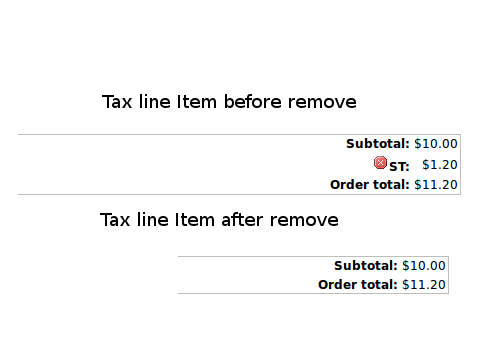 * Allows tax line item to be removed from orders. Step-1). Open a file "MODULE_PATH/ubercart/uc_order/uc_order.line_item.inc" on your favourite editor. Find the function uc_order_delete_line_item($id, $order = FALSE) //Line No:91 and make change as bellowed example. Step-2). Open a file "MODULE_PATH/ubercart/uc_order/uc_order.order_pane.inc" on your favourite editor. Find the function uc_order_pane_line_items($op, $order, &$form = NULL, &$form_state = NULL) //Line no: 636 and make change as bellowed example. Step-3). Open a file "MODULE_PATH/ubercart/uc_taxes/uc_taxes.modules" on your favourite editor. Find a function uc_taxes_uc_order($op, $order, $arg2) Line no:183 and make change as bellowed example. // Now add line items for any remaining new taxes.